Tools needed: threading the needle - knotting the thread - running stitch - basting stitch - backstitch - slipstitch - blanket stitch - whip stitch and finishing with knots. Fabric - Might I recommend going to your local sewing store and buying some remnants to start off with? Remnants are small bits of fabric from the end of a fabric roll. Threading the needle - When it comes to thread, more is better. Aim for cutting twice as much thread as you think you'll actually need. 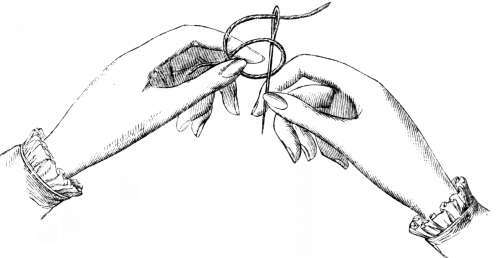 Taking one end of the thread between your thumb and forefinger, insert it through the eye of the needle. Then, bring the needle to the halfway point by bringing both ends of the thread together. Once there, secure the ends in a knot. Pierce the needle through the wrong side of the fabric. That is, pierce it through the side that people won't be seeing. Pull it out and through, followed by the thread, all the way until it's stopped by the knot. If your knot goes through, simply make a bigger one. Pierce the needle through the right side of the fabric. Close to where you pierced your material initially, push the needle back through to the wrong side. Pull the entire length of thread and keep pulling until you feel resistance. Repeat the previous two steps. Always keeping close to your last stitch, pierce through the wrong side again. Pull all the thread out and voila - your second stitch. Continue doing this, making sure each stitch is the same length as the one before.